Idiopathic intracranial hypertension (IIH) is a rare but important disease associated with significant morbidity. There is an expected rise in prevalence in line with the escalating global burden of obesity. Modern revisions in the terminology and diagnostic criteria for IIH help guide clinicians in investigations and researchers in standardising recruitment criteria for clinical trials. The pathophysiology of IIH is incompletely characterised; suggested underpinning mechanisms include the role of cerebrospinal fluid regulation as well as metabolic and endocrinological perspectives. Recent treatment trials are providing insights into the management but debate still surrounds key areas in treatment. This review will provide an up-to-date discussion on the potential pathogenic mechanisms and management of IIH. Idiopathic intracranial hypertension (IIH) is characterised by raised intracranial pressure (ICP) of unknown cause, when all other causes of raised ICP have been excluded.1 IIH causes significant morbidity, including permanent visual loss in up to 25% of cases2 with reports of 1–2% of new cases being registered blind per year3 and disabling headache in the majority.4 With peak presentation being between ages 20 and 40 years5; an overwhelming female predominance and a strong association with obesity5; IIH, is well known as a disorder that affects overweight women of reproductive age. The aetiology and pathology are not fully established, and the disorder has become the subject of increasing scientific scrutiny over the last decade. With no single cause implicated, uncertainties surround the best therapeutics which have led to differing management strategies. Both adults and children can be affected by IIH, however, paediatric IIH may have different pathogenesis and clinical course10 and is not discussed in this article. In this review, we review adult onset IIH with focus on the latest developments in both the pathogenic mechanisms and management. The nomenclature and diagnostic criteria used to describe this condition have evolved over time. The first case of IIH, then termed serous meningitis, was probably reported in the 1890s by Henrich Quincke, a German physician, when lumbar puncture (LP) was first introduced. Nonne11 ,12described a series of cases, similar to Dandy,13 of raised ICP without tumour termed pseudotumour cerebri. Both series contained cases that we now recognise as raised ICP secondary to a known aetiology. The maturing nomenclature and diagnostic criteria have reflected the advances in investigating patients, particularly neuroimaging and understanding of normal CSF opening pressure measurements, and our increasing appreciation of the clinical course of the disease. Some patients have a mild and self-limiting course, while others experience substantial morbidity from visual loss and persistent headache. The underlying pathogenesis of IIH is uncertain. Raised ICP is a uniform characteristic, but the mechanism by which ICP is elevated in IIH is not clear. It is also questionable whether a single unifying mechanism elevates ICP in these individuals (figure 1). Secondary causative factors which lead to elevation of ICP may be mechanistically distinct from truly idiopathic causes. Schematic diagram of the possible pathophysiological mechanisms in idiopathic intracranial hypertension (IIH). Cerebrospinal fluid (CSF) is produced mainly by the choroid plexus epithelial cells, with a small amount being secreted by ependymal cells that line the ventricular system. Classically, CSF was thought to drain predominantly through the subarachnoid space through arachnoid granulations into the superior sagittal sinus. Evidence also suggests CSF drains through the cribriform plate along cranial nerves into the nasal lymphatics (yellow). The most recent hypothesis proposes bulk flow of fluid along perivascular routes (glymphatic pathway) which is cleared from the brain into the subarachnoid CSF, bloodstream or cervical lymphatics. Supporting this concept is the recent discovery of lymphatic vessels (yellow) in the dura that drain into the deep cervical lymph nodes. 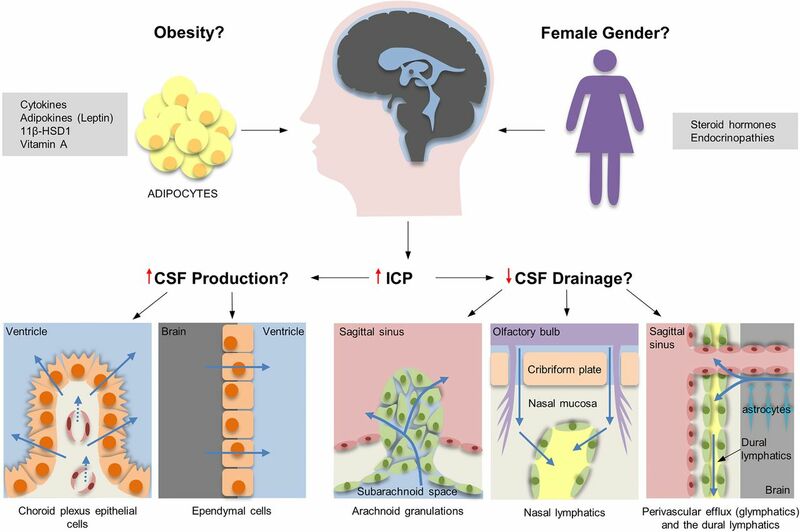 Changes in the volume of blood, CSF and brain tissue influence ICP. IIH likely represents a disorder of CSF regulation, potentially through CSF hypersecretion or reduced drainage. Dysregulation of fluid transport in IIH may be important. The water transporting channel, aquaporin 4, is localised to the astrocyte foot process, and has a role in fluid transport predominantly relating to cerebral oedema. Anti-aquaporin 4 antibodies have not been identified in IIH,17 and there is no evidence of upregulation of the aquaporin 4 gene.18 Aquaporin 1 is another candidate as these channels are predominantly in the choroid plexus, can be upregulated by retinoids and glucocorticoids, and are affected by medications used to treat IIH. Historically, it was believed that CSF drains from the subarachnoid space through arachnoid granulations into the superior sagittal sinus. However, evidence of CSF drainage through the cranial nerves, and the cribriform plate into the lymphatics, has been demonstrated in various species, including humans, using microfil injections.19 Recently in mice, lymphatic vessels have been discovered lining the dural sinuses which are then able to drain CSF into the deep cervical lymph nodes.20 This latest research disputes the long-held belief that the central nervous system lacks a lymphatic system. In addition, the newly named ‘glymphatic pathway’ suggests that there is an exchange in fluid between the CSF in the subarachnoid space and the interstitial fluid in the brain along paravascular routes (figure 1).21 Arachnoid granulation agenesis in children does not always result in elevated CSF, indicating that alternative CSF drainage pathways are functioning. There is very limited understanding of the role of lymphatic and glymphatic drainage in IIH, but these pathways may well be highly relevant. Despite the association between IIH and an obese phenotype, the pathological mechanisms tying the two together are unclear, and IIH is a rare disorder, while obesity is common. Suggestions that centrally distributed adiposity transmits pressure, thereby generating raised ICP, are questionable, as few obese patients have elevated ICP. Additionally, studies of waist:hip ratios in patients with IIH suggest that adiposity is predominantly in the lower body in IIH patients, by contrast with central adiposity of typical obesity.28 A number of studies have evaluated cytokine and adipokines profiles in the serum and CSF of patients with IIH, but have been limited by small numbers and suboptimal control groups. Results have not been consistent, which may also be related to differences in the sensitivity of the assays used. Leptin, an adipokine which regulates satiety at the hypothalamus, was elevated in the serum in one study, but this effect was absent when BMI was controlled for.29 ,30 CSF leptin levels appear elevated in IIH compared with controls matched for BMI, age and gender. However, it remains to be established whether dysregulation of adipokines and cytokines are pathogenic in dysregulating ICP, or merely reflect a consequence of the disease. 11B-HSD1 is also dysregulated in obesity and the metabolic syndrome and consequently specific inhibitors are being developed as novel therapies. (A) MRI T1-weighted sagittal imaging demonstrating an empty sella (the pituitary gland has been flattened against the wall of the sella). (B) MRI T2-weighted axial image demonstrating flattening of the posterior globes at the insertion of the optic nerves, protrusion of the optic nerve head into the vitreous and increased fluid in the optic nerve sheath complex bilaterally. (C) MRI T2-weighted axial image demonstrating tortuosity (kinking) of the intraorbital optic nerve on the left with fluid in the associated optic nerve sheath complex. (D) MR venography (posterior view) demonstrating a longitudinal extensive left transverse sinus stenosis (extraluminal appearance). Other ophthalmic-related symptoms include transient visual obscurations and diplopia.10 ,45 Transient visual obscurations (TVO) are characterised by transient visual loss or greying out of the vision, and are usually related to postural changes or straining. They tend to last no longer than a minute, and occur in one or both eyes. TVO are thought to be the result of disc oedema causing transient ischaemia at the optic nerve head. Diplopia occurs in one-third to two-thirds of patients with IIH at presentation.2 It tends to be binocular and horizontal, as a consequence of abducens nerve palsy, and can resolve with normalisation of ICP. Monocular diplopia may occur in the presence of severe papilloedema as a result of macular oedema or later due to epiretinal membrane formation. Pulsatile tinnitus is common and may be unilateral or bilateral.2 ,10 ,42 Other associated symptoms include mood disturbance and impairments in memory and concentration. They include MRI scan findings consistent with raised ICP (figure 2). Additionally, they have recognised that IIH may occur in the absence of symptoms of elevated ICP and rarely in the absence of papilloedema, so-called IIH without papilloedema (IIHWOP). There are a number of identifiable causes that give rise to secondary intracranial hypertension such as anaemia, obstruction to venous drainage and exposure to various pharmacological agents, for example, tetracyclines, hypervitaminosis vitamin A and retinoids (table 2). Neuroimaging, either MRI or CT or MRI, must exclude hydrocephalus, structural lesions, abnormal meningeal enhancement and cerebral venous sinus thrombosis. Polycystic ovarian syndrome (PCOS) is a chronic endocrine condition characterised by menstrual irregularities, ovarian dysfunction, hyperandrogenism and hirsutism. The prevalence of PCOS in women with IIH is reported to be as high as 39–57%,46 compared to 7–18% in the general population. Similar to IIH, PCOS is a disorder of women of childbearing age, associated with obesity, high serum leptin levels and low-grade inflammation. Comprises three patients (A–C). All have a composite of colour fundus photograph on left hand side. Spectral domain (SD) optical coherence tomography (OCT) cross-section image through the optic nerve head, above. The extent on the retinal nerve fibre layer is depicted between the fine red (internal limiting membrane (ILM)) and green lines in this grey scale image. SD-OCT retinal nerve fiber layer (RNFL) thickness line graph showing RNFL thickness values, below. The fine black line depicting the patient's data, and the block colours (green, yellow, red) showing the normative data. Humphrey visual field 24-2 grey scale image on right. VFI, visual field indicator; MD, mean deviation; PSD, pattern SD. Patient A, a newly diagnosed patient with IIH, showing Frisen grade 3, there is obscuration of more than one major vessel leaving the disc, there is a circumferential halo and elevation of all borders. Paton's lines (curvilinear chorioretinal folds adjacent to the temporal (left hand side) of the optic disc margin) are evident. Patient B, a newly diagnosed patient with IIH with Frisen grade 2 there is no major vessel obscured. Circumferential halo and elevation of the nasal border only. Patient C, a treated patient with IIH who has resolved papilloedema (Frisen grade 0). There is reduction in the RNFL thickness which is due to resolution of swelling, but also axonal loss. There is a centrocecal visual field defect. Features of papilloedema include initial hyperaemia of the disc, blurring of the disc margins, elevation of the disc with a periapillary halo, loss of spontaneous venous pulsation and obscuration of major vessels (figure 3). In severe papilloedema, retinal vessels crossing the disc margin and overlying the optic disc are obscured by the oedematous nerve fibre layer; retinal haemorrhages and cotton wool spots may be present, serial colour fundus photographs are useful in recording disc findings and help document resolution. Formal grading of papilloedema using the Frisén scale has been shown to have a limited reproducibility with high intraobserver and interobserver variability, and requires a senior level of expertise.48 Quantification of disc swelling using optical coherence tomography (OCT) is an important development. OCT permits high-resolution non-invasive cross-sectional imaging of the neurosensory retina (figure 3). It is analogous to ultrasound imaging, measuring light waves rather than sound.49 Measurement of the following parameters: retinal nerve fibre layer (RNFL) thickness; total retinal thickness; optic nerve (ONH) volume; and retinal ganglion cell layer thickness; for longitudinal monitoring of papilloedema is useful.50 Practically in IIH OCT measurements have been shown to correlated with Frisén grade, but not clinical features or visual dysfunction.50 However, RNFL thickness demonstrates an indiscriminate ability to separate the resolution of papilloedema from axonal loss in optic atrophy (as exampled in figure 3).51 As the technology advances, for example enhanced depth imaging and newer light sources, OCT will hopefully be able to distinguish buried ONH drusen. 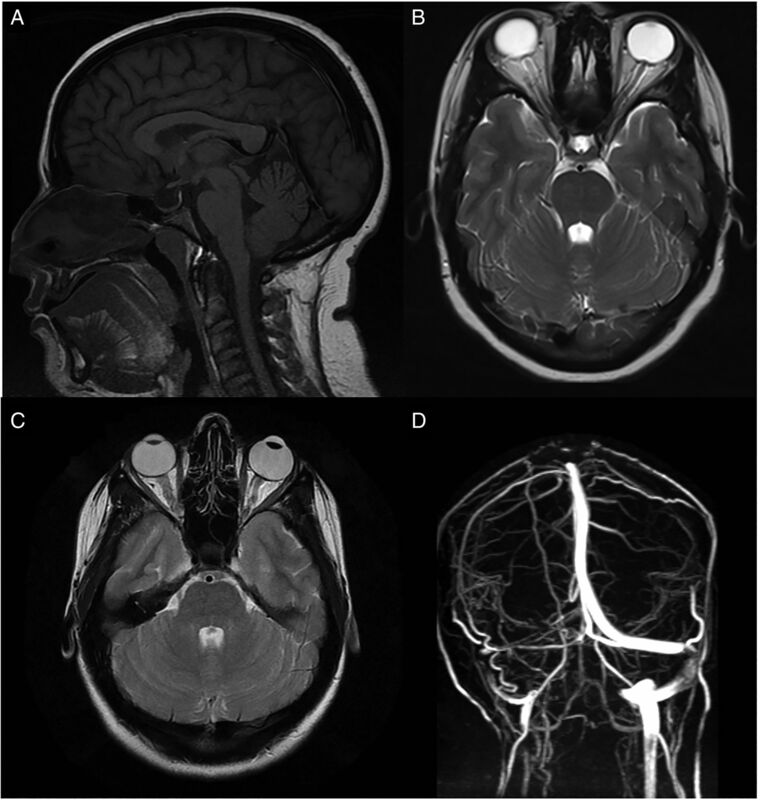 Brain imaging has a central role in excluding space-occupying lesions, obstructive hydrocephalus and cerebral venous sinus thrombosis once papilloedema has been diagnosed. Ideally, MRI head and orbits with intravenous contrast and MR or CT venography should be performed. Figure 2 shows commonly observed radiological signs of raised ICP although none are pathognomonic of IIH. The 2015 Cochrane review concluded that there is no current consensus on the best management strategy for IIH.12 The two key approaches in IIH are to preserve visual function, and to reduce long-term headache disability. The treatments employed depend largely on the patient's level of visual function and rate of progression. Accepted medical interventions range from dietary therapy (eg, responsible and sustainable weight loss, lifestyle modification, low-salt diet) to medications and surgical treatment. A low-salt diet is often recommended in IIH based on the association with orthostatic oedema in women.54 However, there is no direct evidence for the mechanism of action of salt restriction in vivo to reduce ICP. On the basis of small studies showed that reduction of body weight by 6% was associated with improved visual function and papilledema grade in IIH,32 ,52 weight loss was studied in a prospectively designed cohort study.27 Patients with chronic IIH were treated with a severely restricted calorie-controlled diet (425 kcal/day) for 3 months following a 3-month observational period; 44% of the patients took a stable dose of acetazolamide during the study. Internal comparators prediet and postdiet within the same patient demonstrated significantly reduced ICP measurements (−8 cm CSF, p<0.001), headache scores and papilloedema. There was a 15% mean weight reduction (p<0.001). All qualitative and quantitative improvements were sustained at 3 months postdiet cessation. This study provided evidence that weight loss can lower ICP. Obesity pharmacological therapies, such as tetrahydrolipstatin and phentermine/topiramate may induce a modest weight loss, but have not been specifically studied in IIH.55 There is class IV evidence for bariatric surgery as an effective treatment for IIH in obese patients, both in terms of symptom resolution and visual outcome.55 A randomised control trial evaluating bariatric surgery in IIH is currently underway (Clinical trials. gov ID NCT02124486). Ball et al57 in the UK, prospectively evaluated acetazolamide use in mild IIH. Fifty patients were recruited and randomised to receive acetazolamide (daily dose between 250 and 1500 mg) or placebo. Symptoms, body weight, visual function and quality-of-life measures were recorded. Regardless of treatment allocation, all overweight patients were advised to follow a weight reduction programme. There was no significant difference between the treatment arms at the final 12-month follow-up evaluation; based on this study design, a sample size of 320 would be required to demonstrate a 20% treatment effect. Overall, most participants showed clinical improvement, with 44% judged to be in remission at trial end. Mean weight loss was 6.2 (5.8%) and 3.3 kg (3.5%) in the treatment arm and control arm, respectively. They highlighted issues in conducting a trial in IIH that included recruitment, choice of outcome measures and adherence to acetazolamide. The Neuro-Ophthalmologic Research Disease Investigator Consortium (NORDIC) enrolled 165 participants to the IIH Treatment Trial (IIHTT).58 This was a multicentre, randomised, double-masked, placebo-controlled trial designed to determine the efficacy of acetazolamide compared with placebo in IIH, with both arms also receiving a supervised weight-reduction, low sodium diet. The initial dosing of acetazolamide was 500 mg twice a day with a schedule to increase the dose by 250 mg every 6 days up to a maximum of 4 g daily. Participants who could not tolerate the study drug could decrease the dosage to a minimum of 125 mg/day. All participants received a specific dietary plan and lifestyle modification programme. The primary outcome measure was the change in perimetric mean deviation (PMD) on automated visual field analysis at 6 months. The study population included individuals with IIH and mild visual field loss, defined as PMD of −2 to −7 dB in the worst eye59 (figure 3 shows two patients (B and C) visual fields that fall between −2 and −7 dB). Both treatment groups in the IIHTT showed improvement in the primary outcome measure of PMD from baseline (−3.53 dB in both groups). At 6 months, the PMD in the acetazolamide group had improved more than the placebo group (−2.10 dB compared to −2.82 dB, a difference of 0.71 dB, p=0.05). 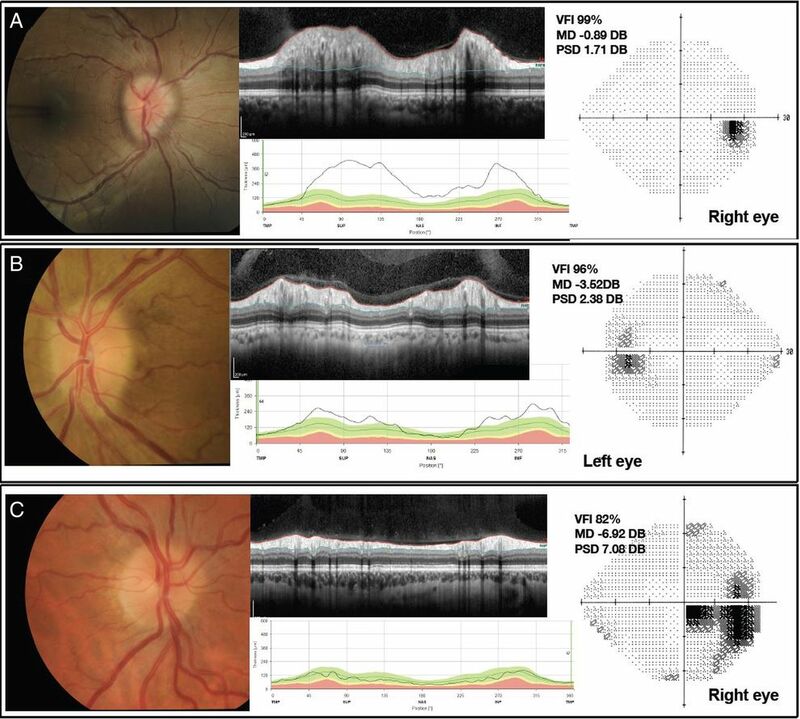 Significant difference in improvements between the acetazolamide and placebo group was also reported for the fellow eye PMD, Frisén papilloedema grade, CSF opening pressure and quality-of-life measures including the Visual Function Questionnaire-25 and its neuro-ophthalmic supplement. No significant difference between the groups was found in visual acuity in the study or fellow eye, headache or headache disability. Both groups lost weight at 6 months from a baseline of 107.72 kg. Those receiving acetazolamide lost more weight (−7.50 kg) than those receiving placebo (−3.45 kg), and this difference was highly significant (p<0.001). The mean dose of study drug in the acetazolamide group at conclusion of the study was 2.5 g/day, which is in excess to what is normally prescribed in routine UK clinical practice due to side effects. Indeed, in the IIHTT, adverse effects of fatigue, nausea, diarrhoea, vomiting and paraesthesia were significantly higher in the acetazolamide group. There were 6 treatment failures in the placebo group and only 1 in the acetazolamide group. 19% of subjects withdrew from the study but the reasons and frequency of withdrawal was similar in both groups. The IIHTT provides class 1 evidence that acetazolamide use provides a modest improvement in visual field function in patients with IIH with mild loss. Other diuretics, such as furosemide, are used in IIH, when acetazolamide is contraindicated or not tolerated. There is animal evidence that furosemide reduces CSF production, possibly by a different mechanism to acetazolamide, and it is postulated that it might have an additive effect to acetazolamide.61 Caution is advised when combining diurectics, as severe hypokalaemia may result. Octreotide is a somatostatin analogue which inhibits pituitary growth hormone (GH) secretion, and antagonises GH and insulin-like growth factor action by blocking GH receptors. Somatostatin receptors are highly expressed in arachnoid villi and choroid plexus and, therefore, may be related to CSF production and absorption. Following case reports, an unblinded, open-label study reported resolution of papilloedema in 92% of cases with further improvement in other visual parameters and headache.62 Given the observational nature of this study, the small study size, and the lack of a control group, further data are required. If medical therapy fails, is not tolerated, or there is fulminant IIH, more aggressive measures should be considered. Management options include serial LP; optic nerve sheath fenestration (ONSF); neurosurgery employing shunts and stenting of the transverse venous sinuses. The decision regarding the choice of surgical procedure often depends on local expertise and the patient's morbidity. Occasionally, a single LP may be all that is required to put IIH into remission.63 Serial LP are useful temporising measures while awaiting surgery, or in pregnant patients who wish to avoid medical therapy. LP may reverse transverse venous sinus collapse by lowering CSF pressure, therefore, providing temporary relief until the sinus re-collapses, usually within weeks. Complications include low-pressure headaches, CSF leak and CSF infection. CSF diversion surgery was initially employed in 1949 using ventriculoperitoneal shunts, and by the 1970s, good outcomes were reported with lumboperitoneal shunting (LPS). In LPS, a catheter inserted into the subarachnoid space at the level of the lumbar spine is then tunnelled under the skin, continuing around the oblique muscles and into the peritoneal cavity where the drained CSF is absorbed. Shunts with a valve system and CSF reservoir are recommended as they reduce risk of significant pressure fluctuations. Complications of CSF diversion surgery include shunt infection, shunt obstruction, intra-abdominal pain and CSF leak. Rarer complications include cerebellar tonsillar herniation and syringomyelia, subdural and subarachnoid haemorrhage, and bowel perforation. Shunt revisions have been reported in 51% of patients and multiple revisions required in 30%.66 Sinclair et al66 found significant improvements in visual acuity maintained postoperatively at 6 (p=0.002) and 12 months (p=0.016), but headache symptoms persisting in the majority of patients at 12 months. Teleb et al67 reported the largest group analysis to date for the endovascular management of IIH. The gradient threshold at which the transverse sinus stentings (TSS) were performed varied between ≥4 to ≥10 mm Hg. Antithrombotic therapy was typically dual antiplatelet therapy (aspirin and clopidogrel). Patients were pretreated and expected to remain on dual therapy for up to 6 months, followed by aspirin for up to 12 months. Complications of the procedure include a short-lived ipsilateral headache in many, restenosis and, in rare cases, vessel perforation leading to acute subdural haematoma, stent migration and thrombosis. TSS conferred functional improvements in symptoms and signs including headache, papilloedema grade and reported visual loss. There are currently major limitations of evidence with case series being non-randomised, not detailing morphological stenosis type, being small in size with selection bias and a lack of long-term follow-up.68 At least one death has been reported, with known cases of life-threatening haemorrhage and herniation following stenting. Our practice is to treat the predominant headache phenotype, typically using migraine-preventative strategies. It is worthy of note that some of the commonest medications here can cause weight gain. An excellent review in this area covers these options in detail.72 Shunting is generally ineffective management strategy for raised ICP headaches, as 79% still have headaches at 2 years, low-pressure headaches may develop (28%), and shunt failure is a major issue (>50% are revised).66 Weight loss strategies significantly improve headache.30 In the IIHTT, headache disability improved in both treatment groups with no benefit of acetazolamide compared with placebo.58 As headaches have such a significant impact on patients, management by a headache medicine specialist is recommended. For patients with IIH, the journey is typically extremely challenging. The diagnostic process with urgent brain imaging and LP is frightening and painful. The ensuing discussion about the causative role for obesity may be insensitively handled by the busy physician and can be psychologically damaging for the patients. For many, the reality is a long-term illness dominated by drug side effects, headaches, potential depression and in some surgery, which can be recurrent. The impact on their family life, occupation and earning potential is great. A number of factors could impact on cognitive function in IIH (depression, headaches, sleep apnoea, obesity, medications and raised ICP). One study reported reduced reaction time and processing speed in patients with acute IIH compared with age and gender-matched controls. These deficits were maintained at a 3-month follow-up, despite improving headaches and ICP.75 Another cross-sectional study has also demonstrated multidomain mild cognitive impairment in IIH, with lowest scores in visuospatial, attention and global indices.76 Cognitive dysfunction may contribute to the patient morbidity, however, it is largely uncertain whether the deficits are chronic or related to treatment effects. Isolated, single LP measures are not ideal in assessing patients with chronic headaches as ICP fluctuates diurnally. In some cases, a period of prolonged CSF monitoring, ideally while the patient is ambulatory is helpful.79 Accurate diagnosis is essential to ensure chronic migraine with a borderline-raised ICP are not incorrectly labelled as having IIHWOP. IIH is classified as a rare condition, and early diagnosis and treatment are imperative to prevent permanent visual loss. The burden on the health service is significant and costly due to high healthcare utilisation by patients. This is unlikely to improve in the setting of growing global obesity figures. For clinicians managing patients with IIH, questions remain about the optimal evidence-based approach for management. The conundrum of how obesity and female gender contribute to the underlying aetiology remains. IIH is a multisystem disorder encompassing neuroscience, ophthalmology and endocrinology and cross-specialty collaboration will be integral to advance our understanding of IIH. In the clinical environment, multidisciplinary input is essential to optimise patient care. Recent research momentum has led to important progress in our understanding and management of IIH. The field continues to advance with a number of ongoing trials (eg, IIH:WT evaluating weight loss strategies and bariatric surgery (NCT02124486), and IIH:DT evaluating a novel 11β HSD1 inhibitor (NCT02017444), stenting in refractory IIH (NCT02143258)), and studies the NORDIC group evaluation of vitamin A and genetics). The results of these studies are eagerly anticipated, and will, hopefully, translate into improved patient care.
. Symptomkomplex ‘tumor cerebri’ mit Ausgang in Heillung (Pseudotumor cerebri). Über Letal Verlaufene Fälle von ‘Pseudotumor Cerebri’ mit Sektionsbefund. Dtsch Z Nervenheilkd. 1904;27:169–216.
. Radioisotopic cisternography in benign intracranial hypertension of young obese women. A seven-case study and pathogenetic suggestions. Acta Neurol (Napoli) 1992;14:39–50.
. The effect of acetazolamide and furosemide on cerebrospinal fluid production and choroid plexus carbonic anhydrase activity. J Pharmacol Exp Ther 1974;189:194–201.
. Octreotide: a therapeutic option for idiopathic intracranial hypertension. Neurol Neurophysiol Neurosci 2007;1.
. Medication overuse headache—an under-diagnosed problem in shunted idiopathic intracranial hypertension patients. Br J Neurosurg 2014; 29: 1–5. Contributors AJS conceived and designed the manuscript. All authors contributed to the writing of the manuscript. AJS and SPM edited the manuscript and all authors reviewed the final manuscript. Funding AJS is funded by an NIHR Clinician Scientist Fellowship (NIHR-CS-011-028) and the Medical Research Council, UK (MR/K015184/1).